CHICAGO (AP) Coach Luke Walton is curious to see if the Los Angeles Lakers’ recent success at home will travel during a five-game road trip. The answer in the opener Friday night was positive – with a few tense moments along the way. Los Angeles trailed 95-92 with less than four minutes to play before Ingram – who also had nine rebounds and was 10 for 18 from the field – started the rally with a pair of free throws. The Bulls rallied again and took a 92-90 lead with 5 1/2 minutes remaining on Valentine’s 3-pointer. It was Chicago’s first lead since 3-2. Mirotic hit a 3-pointer to give the Bulls the 95-92 lead before Los Angeles took control. Ingram’s free throws started a 13-2 run that sealed the win. Bulls: Zach LaVine, playing in just his seventh game of the season following ACL surgery last February, played a season-high 26 minutes. 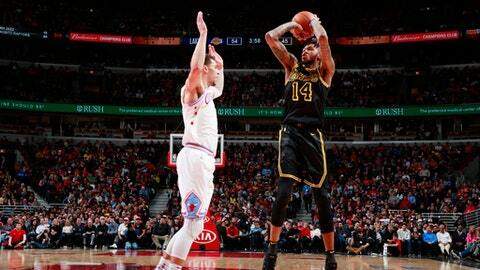 His minutes restriction was lifted to 26-28 minutes before the game … Chicago was 17 for 36 on 3-pointers and now has made at least 10 3s in each of its last 11 home games. Chicago G Kris Dunn missed his fourth straight game with a concussion, and it’s unclear when he might return.